The notorious pirate of one of the most beloved children stories has been captured as a nutcracker. 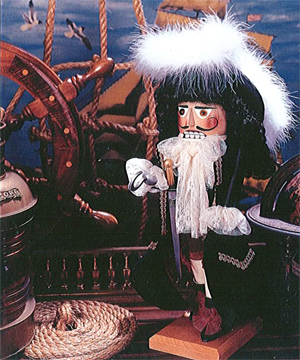 Captain Hook (ES1826) is pictured as he paces up and down the ship and calculates ways to catch the elusive Peter Pan. Captain Hook is the first in the Steinbach Peter Pan Nutcracker Series. He holds a sword, which he uses to battle Peter Pan and his crew of Lost Boys. His most recent battle with a crocodile left him with his legendary hook. This nutcracker is impeccably dressed in velvet and lace with a plumed hat that rivals aristocracy. A devilish rake, Captain Hook sports the trademark of flowing curly locks. This nutcracker is limited to 7,500 pieces and stands 17 inches tall. There are many special items from the Steinbach factory since they have been making nutcrackers but in 2000 Steinbach was thrilled to produce a first for them … a limited edition reptile nutcracker! It was generally unanimous that the Steinbach Peter Pan Nutcracker Series would not be quite the same without the mysterious crocodile to pursue Hook and drive him to the brink of insanity. As the story goes, once Peter Pan feed Hook’s arm to the crocodile, he developed a taste for Hook and pursued him relentlessly. However Hook was continually alerted to his presence due to the telltale sign of the ticking clock the croc had swallowed. What feared Hook most was that day that the clock would wind down… The second in the Peter Pan Nutcracker Series the Crocodile (ES1818) was limited to 5,000 pieces and stands at 17 ½ inches tall. The play Peter Pan was first presented in 1904, weaving a fantasy faraway tale of a boy who refuses to grow up and creates his own world of pirates and fairies. The author, James Matthew Barrie wanted his creation to benefit youngsters as much as possible, so he donated his rights to “Peter Pan” to a London children’s hospital. 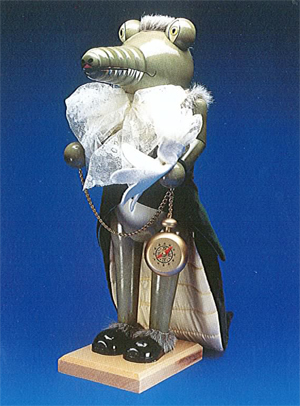 After the Debut of the Captain Hook Nutcracker and the Crocodile nutcracker into the Peter Pan Nutcracker Series it was only right for Steinbach to introduce a Peter Pan (ES1816) nutcracker into this collection. This nutcracker is holding the mischievous sprite Tinkerbell, plays a magical flute and is dressed in a woodsy cloak and cap. 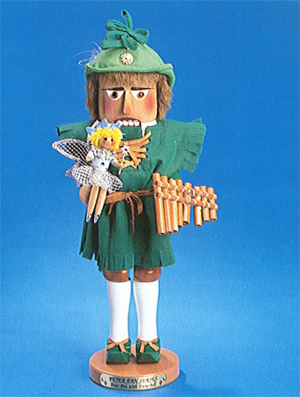 This nutcracker is limited to 5,000 pieces and is the third nutcracker in the Steinbach Peter Pan Nutcracker Series.